Join us for a no-spend February! More than a few people have gone to Costco for milk and vitamins and come home with a trampoline. I agree, @Kelsey – that is some solid-gold resolve. When you’re sick, they are necessities. Hope your daughter is over the bug – and that she didn’t pass it along to her parents. Ha, @anewlife1114! I have not gotten a trampoline by accident. But have come home with a good many unplanned purchases. (I will miss impulse earrings this month.) And now I have a knitting project that will NOT have stripes at the bottom, because I ran out of lavender yarn (looks like I planned it, I think). So far, so good. The fact that it’s very icy outside makes me not want to go anywhere. I did have my weekly lunch with a friend and technically it was my turn to buy. However, she had read the blog post I did on the no-spend February – and volunteered to cover all the lunches this month if I would reciprocate the next month. What a pal! We did get a few groceries the other day, spending $24.20 after the senior discount. Here’s where the hair-splitting gets dicey: The “manager’s special” bin had half a dozen cans of hominy, which my partner loves, at 59 cents each. Technically we didn’t need them, but that’s half-price – and we got an additional 6 cents off per can with the senior discount. And we didn’t need Wheat Thins (still have a couple of boxes) but they wound up being $1.49 a box due to a store sale plus downloaded coupon; that is a screamin’ deal for Alaska, so I made the executive decision to shine on the no–spend in order to save $1.50 per box. Also: Is on-sale ice cream a necessity? Asking for a friend. It depends on how bad your day was, @anewlife1114! How’s everyone doing now that we’re on our second full week?? I’m so proud of how much I’ve been staying in to cook instead of going out to eat. I got a cast iron skillet for Christmas that I’ve been getting a lot of use out of. My favorite dish to make in it so far has been homemade pizza! I bought a ball of pizza dough from Trader Joe’s along with pizza sauce, slices of mozzarella cheese, kalamata olives, onions (which I caramelized) and spinach and mushrooms (which I sauteed). It was quick, inexpensive and honestly a lot better/healthier than pizza I’ve had at local restaurants. Any other exciting discoveries or tips from the group? I’ve reversed how I do the meal planning/grocery shopping. Normally I’d look for recipes, see what we’re running low on and make a list for the store (which would be supplemented by numerous impulse buys). Now I first look for what we have too much of (see above) and I start building the menu plan from that. For example: The partially-used bags of breaded chicken tenders and meatless meatballs from Trader Joes that were not a hit on their own. They were much more popular as 1) sweet-and-sour chicken and 2) a minor ingredient in an amped-up spaghetti sauce. Looking forward to other ideas and getting updates on how your month is going! I love that idea! I have a lot in my pantry that I should be using up. I’ll aim to follow your lead the rest of this month. Me, too @lweston and @Chanelle_Bessette . . . Although there was nothing fabulous to be done with the mahi-mahi patties I don’t remember when or why I bought. Food has been the biggest thing. (And moneywise, getting sick worked out for me. I already had oyster crackers and tea.) The biggest challenge for me is coming up with something when tired . . . I also tried looking online for recipes, using the produce that wouldn’t last much longer, plus ingredients on hand (in my case spinach and zucchini, plus chicken, rice, several kinds of last bits of cheese, spices, etc.). Last night, after a very stressful day, I caved and let my husband treat me to Chinese takeout. My resolve was weekend after a glass of bourbon. My takeaway: Have a solid plan in place for dinner BEFORE we pour a drink. Also, I really need to get my husband on board with the next no-spend challenge. Last week was much more successful. I ate all of my meals at home and spent just $9 over the course of the week. The $9 was for coffee from Philz, which is next to the urgent care where we spent five hours on Saturday (my husband lost a game of tug-o-war with our dog). I considered the coffee an essential in that situation! I know I will have a few non-essential expenses this week. I am sending my nephews a Valentine’s Day package, with a bunch of goodies I bought last month. I’ll need to pay for shipping, but I am skipping UPS (my go-to, because it’s around the corner) and using USPS to save money. I also need to buy ingredients to make a special Valentine’s Day dessert for my husband. He’s taking me out to dinner, but I’m making dessert and cocktails at home afterward. @Chanelle_Bessette I LOVE my cast iron skillet and use it for everything, but I’ve never made pizza in it before. I’ll need to try this! Those mahi-mahi patties! I think they snuck into our carts when we weren’t looking. I want to report a personal best: I visited our local mega-IKEA (gasp), had a free meal thanks to a voucher–and bought nothing. That has never happened before. The no-spend life: Different strokes for different folks. Are we done yet? Wait…what…? It’s only mid-February…?! OK, turns out I would be the ideal candidate for some kind of “how not to spend” makeover show. So far this month, I’ve gone out to eat once, gone out for drinks once, purchased tickets to a theater show (it’s in April but they were selling out fast), and purchased tickets to a music show (Lizzo!!! also in April, also selling out fast). I don’t regret any of my purchases, which feels good. And actually, I do feel like our no-spend February has got me thinking two or three times before making those purchases… a habit I’m hoping to carry forward to the rest of the year. To quote @Bev, I’m sure Amazon thinks I’ve died. I’m expecting a condolence card from its server farm any day now. Amazon knows I am alive. I got a gift card, and so SOME of my “what I am going to buy in March” list got bought. But, um, the month turned into spend-less-than-usual (not counting the fact that the month is shorter than usual) month. And I took my Instant Pot out of the box and used it. Trying to hang on (or strengthen my grip) for a strong finish. But last week looked a lot like I was going for three weeks out of four. How’s everybody else? We’re A-List members at AMC, which means we can see up to three movies a week without paying more for the tickets. (I hesitate to use the word “free,” because you pay a monthly subscription fee.) So yesterday I saw the Oscar-nominated animated shorts at one theater (yes, “Bao” was delightful, but I was rooting for “Late Afternoon”) and then joined my hubby to see “Fighting With My Family” (which was a lot of fun, BTW) at another. Also cashed in some rewards for a “free” large popcorn and large soda, which reminded me why I typically don’t get movie popcorn and soda. Parking was free with validation at the first theater and I thought it would be at the second, but had to pay $4. Cashed in a TravelZoo voucher that was about to expire to get $50 of goodies at Dylan’s Candy Bar. Went $4 over, but now hubby has plenty of chocolate bars to reward/bribe his teaching assistants. Noticed for the first time that parking at The Grove is free for the first hour. That could inspire quicker trips in the future. Our blue recycling bin hasn’t overflowed once this month. By this point, it’s normally been so stuffed with cardboard Amazon boxes at least once that I’ve had to hold off adding other recyclables because there just isn’t room for them. I’m not about to bail on Amazon entirely, but I’m going to do a better job of bunching my orders to a) reduce waste and b) reduce the carbon footprint of so many delivery truck visits. Looking forward to hearing how it’s going for everyone else! What have been your scores and setbacks? No-spend February was fun – an exercise in thinking twice, or even three times, before making a purchase. 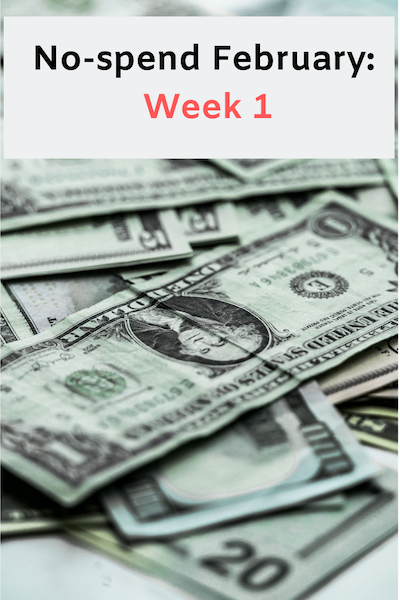 That exercise really focused my attention on my spending, which, this no-spend month has reminded me, is largely around eating out and entertainment, as well as packaged food at the grocery store. I didn’t do any non-grocery shopping in February, which isn’t that unusual for me. I’m not much of a shopper (I make maybe one or at most two Amazon purchases a year! ), except I do have a habit of buying dog toys from the local pet supply store, though I didn’t make any such purchases in February. But my husband and I do spend, and spend big, it turns out, on eating out and entertainment. I’m OK with the fact that, in February, we bought tickets to three events later this year. These are events I’m really excited to see, and theater and music is a big part of our lives, so this isn’t the type of spending I’m not looking to stop, though I do want to be very mindful of our purchases and only buy tickets for shows that we’ve determined are a “must see” for us. On the other hand, I definitely want to get back to eating at home more often. We did manage to do that in the second half of February, thankfully. I actually really like eating at home, we both like to cook, and it’s nice to save the eating out for special occasions. All in all, I’m glad I took some time in February to pay closer attention to my spending. With my “pay myself first” practices – in which I send money to retirement and savings accounts before I have a chance to spend it – and then spend the rest, it’s easy to fall into some spendy behaviors without realizing it. A month of attention on where the dollars are going is super helpful. I forgot to ask husband if he wanted to do this before I enthusiastically decided I would (he was considerably less enthusiastic). Cooked more and became much better about eating leftovers (as opposed to throwing them away later and having to wash the dish I used for the leftovers I did not eat). Stopped ordering from Amazon (well, except when I had a gift certificate). Toward the end of the month, after spending afternoon with my daughter’s not-quite-walking toddler, and acting as a human high chair and rocking chair and bed (slept on me), I bought portable high chair, Ikea crib and a rocking chair I saw on Facebook Marketplace. I think mostly necessity, though I turned down a free crib because it was visually bigger and . . . um, ugly. And less than a week after we got crib put together. said toddler unexpectedly needed to spend a couple of nights with us. On Saturday (half-price day), baby and I headed to a “gently used” mega-sale for kids that daughter had wanted me to go to with her, where I was so picky that if I was going to spend $2 on any item of clothing it just about had to be new with tags. So basically, I did a ton of spending in late February/early March. Which is why you can’t see a big savings from February on my bills. The cooler thing is there was NO bump up in credit card bills, either. And the “guest nursery” is such a nice combo of happy/tranquil I might sneak in there to read when we have no visitors.